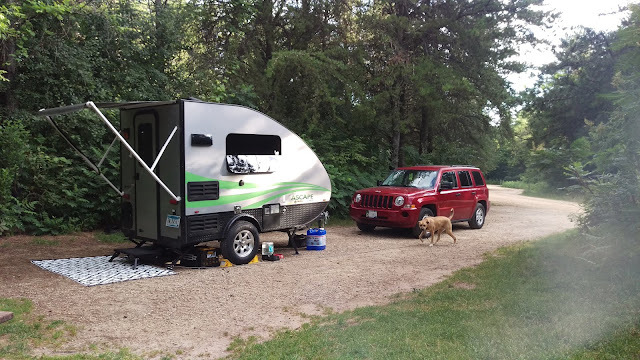 Just returned from the second trip in the Dawghouse, this one to Rice Lake State Park, just outside Owatonna, MN. It's not a big park, and has 40 drive in sites, plus some walk-in, cart-in, and canoe-in sites. It maybe a little over 1 hour drive from the Twin Cities. There are two loops for the drive-in sites - One without electric hookups, and one with (no water or sewage hookups at any site). This is the first trip I took my 15 year old son with. 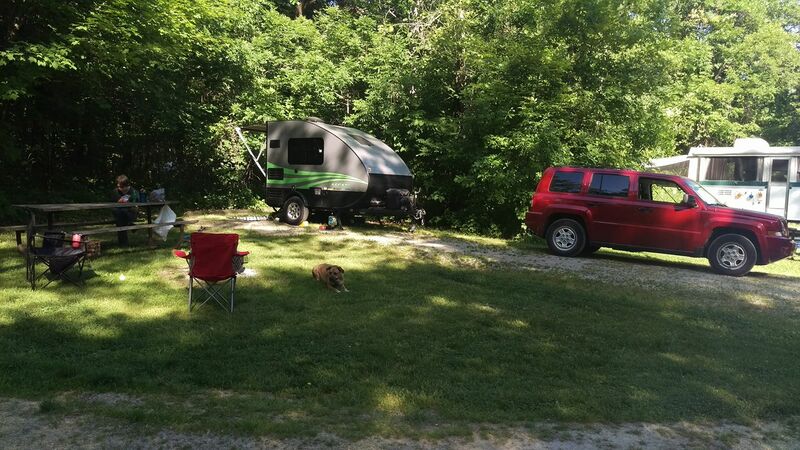 The three of use (my son, me, and my dog, Henry) did pretty good fitting inside the camper. Only one of us could be up and moving around at a time, and even Henry got the hang of that in pretty quick time. During the day, Henry found his spot under the front cabinets, I sat on one side of the table, and my son sat on the other. Sleeping, with the table down and bed made up, we all fit in there just fine. I can't say it's a very good night's sleep - It's a foam mattress about 3 inches thick, but it is a lot better than sleeping on the ground in a tent. The weather was not ideal. It was hot and humid every day, and we had a few storms. 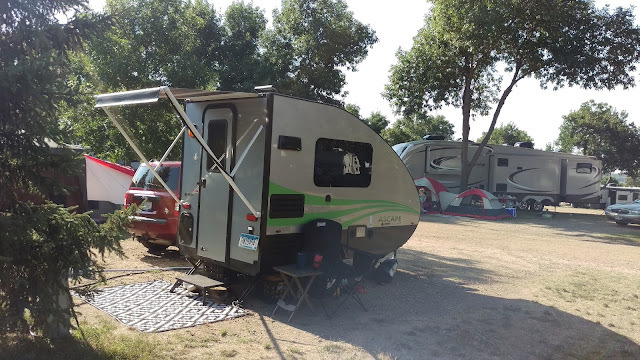 To be honest, we did spend a lot more time inside the camper in the air conditioning than I would have liked, but it made it a lot more bearable. There wasn't much of a cell phone signal, but I found if I set my phone leaning up against the window, I could get enough signal to use the mobile hot spot on the phone, and connect to it with the Amazon Fire TV Stick I have connected to the TV. Sometimes, it took a few tries to get the signal, and there was a lot of buffering of a low-res picture, but it was usable. I do want to build a mobile media server with a Raspberry Pi I have (a miniature, inexpensive computer), but I haven't got that ready yet. 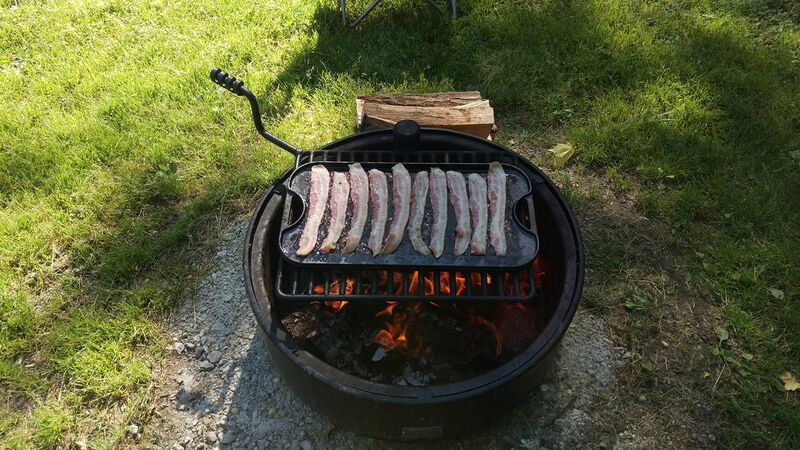 One of the things I've always enjoyed about camping is cooking outdoors. 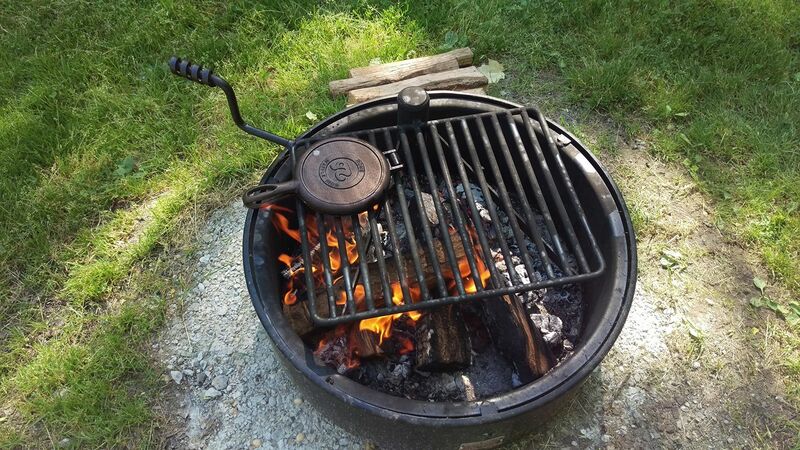 Started with just grilling on a small charcoal grill, and later we would do at least one meal with a grill on a tripod over the fire. This year I started to get into cast iron, and even though I'm still learning, it's been a lot of fun. The first night, after getting set up, I knew that there wouldn't be much time, so we just had sandwiches for the deli at Walmart. The next morning, it was bacon cooked on a cast iron griddle and waffles made with a cast iron waffle maker. The bacon came out a little too crispy, but still not bad. And I went with the waffle recipe that came with the waffle maker, but I'll probably just go back to the box mix in the future. 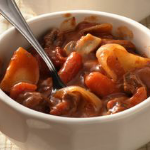 That night, beef stew (recipe below). 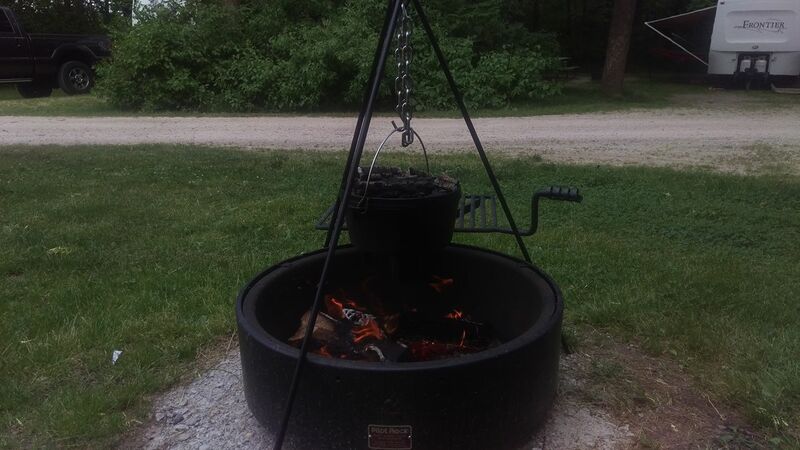 As you can see, it was the dutch oven on the tripod over the fire. This was the first meal I ever made in a dutch oven over the winter, and it's a keeper. Very easy to make, and very tasty. I would have to say this was my favorite meal of the weekend! The next morning was biscuits and gravy (sorry, no pictures - left the phone inside because of rain). I used pre-made, frozen biscuits that you just throw in the oven for about 20 minutes, and made them in the dutch oven. And the gravy was a sausage country gravy, but because the rain was picking up, couldn't cook it long enough to get thick. Still was good, though! 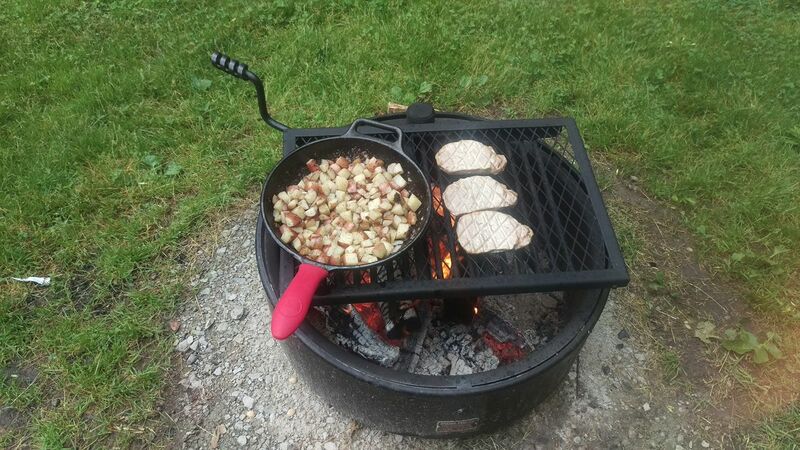 And the last night was pork chops grilled over the fire, and fried potatoes over the fire in a cast iron frying pan. The grill is one I brought with, and since you can't adjust the height over the flame, I had to adjust the flame under the grill. It came out perfect! The potatoes were just the left over from the beef stew (I brought a 3 lb bag and only used about half the bag for the stew), chopped up onion, some butter, salt, and pepper, and that's it. One thing I've learned from this trip - I need to get a couple 5 gallon jugs. The camper has a 11 gallon fresh water tank, but it just doesn't last, and it would be nice to have a couple jugs of water on reserve if needed. 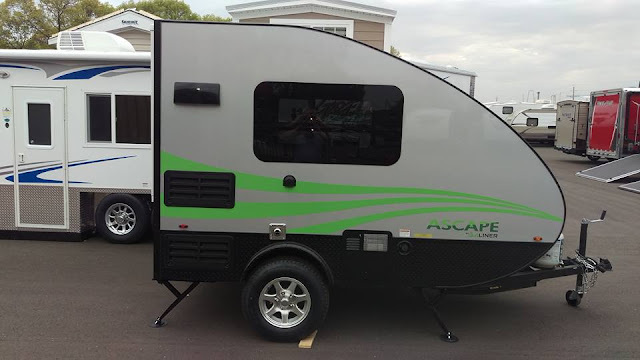 I already have a funnel with a short hose on it, and Velcro on the side of the camper to attach it to right above the fill spout for the tank. But a 1 gallon ice cream bucket makes for a lot of trips from the water spigot top the camper to fill it up. 1) Heat oven to 325°F. 2)In 4-quart Dutch oven, mix all ingredients except potatoes and mushrooms. Cover and bake 2 hours, stirring once. 3)Stir in potatoes and mushrooms. Cover and bake 1 hour to 1 hour 30 minutes longer or until beef and vegetables are tender.